With spectacular roars generously donated by the talented voice actor Morgan Rands at PaizoCon 2015, the "Green Dragon" SoundSet astounds players with the powerful sounds of a very very grumpy Green Dragon. Its wings are great and terrifying, and it's acid breath is sickening and deadly. 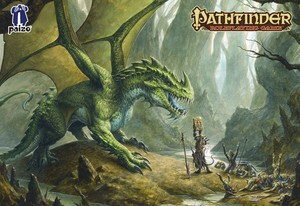 Don't even think of running a Green Dragon encounter without these sounds immersing your players in the grim reality of this hugely powerful opponent!